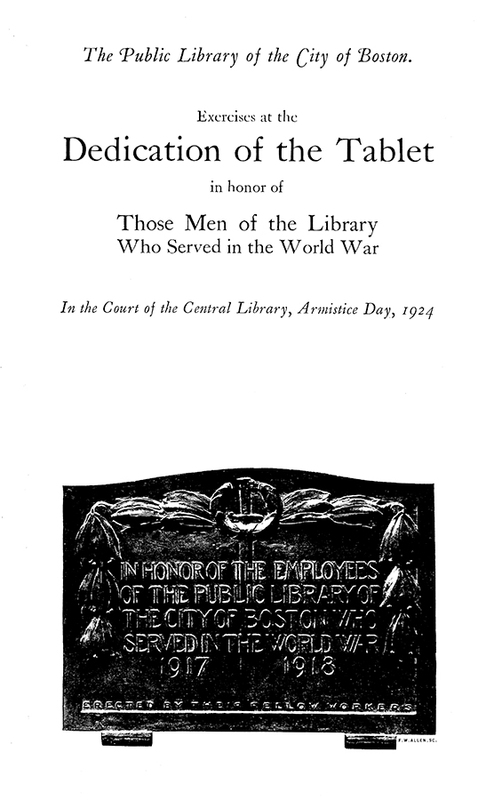 The service was held on Armistice Day, November 11, 1924, commemorating nineteen employees of the library who served in the war between 1917 and 1918. The ceremony was conducted with solemnity beginning with a “grave and beautiful invocation” and ending with the “singing of the National Anthem and the slow heart-wringing notes of taps” by a bugler. At the time of the unveiling, “the flag fell away from the simple and exquisite bronze tablet, showing a drawn sword wreathed in laurel.” The father of one of the dead placed a “magnificent evergreen wreath” on a stand below the tablet. A “splendid” military Major General gave a “matter of fact description of a massed attack” which pointed to the futility, the horrors and glory of war. A judge emphasized “the necessity of personal service in everyday life as well as in wartime.” An orator recited “In Flanders Field” dramatically. After the proceedings, luncheon was served to the veterans and guests and all shared in the effort it had taken to bring this event to fruition, in their memories of the three who were lost and in gratitude for the sixteen lives of those still with them. The event was covered by five newspapers. The tablet is rectangular with a broad raised border and two molded feet under the lower edge. A gentle “camel-back” shaped top edge adds grace to the formal design as does the motif of partially opened wilting lilies with protruding stamens arranged in a chain. There are two horizontal flowers across each side of the vertical sword that intersects the breadth of the rectangle. A laurel wreath, open at the top, banded and tied under guard at the shoulder of the blade, rings the hilt of the sword. Three more flowers hang from a wilted stem across the broad head of a nail or peg near the corners and extend two-thirds of the way down the sides within the border. The point of the sword is centered between the two dates. The lettering is centered, crossing the blade of the sword while leaving space above and below to balance the composition. The last line of the inscription is in small, extended capital letters just above the edge of the lower border. 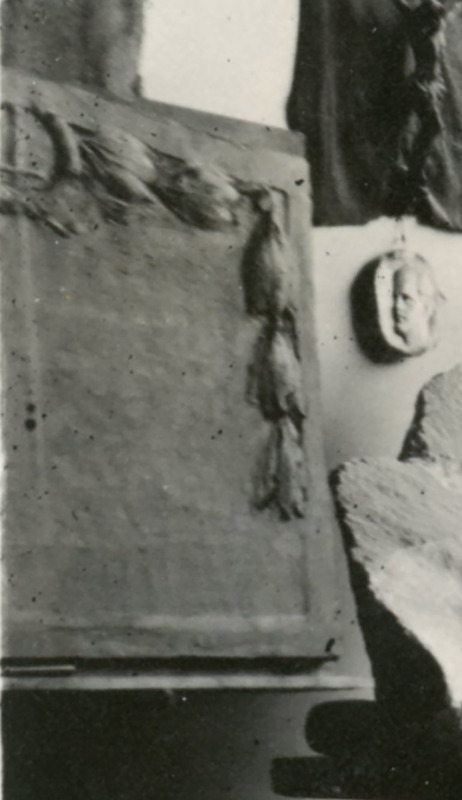 There is a photo of Allen in his studio with the partially finished clay showing it in process without the lettering. 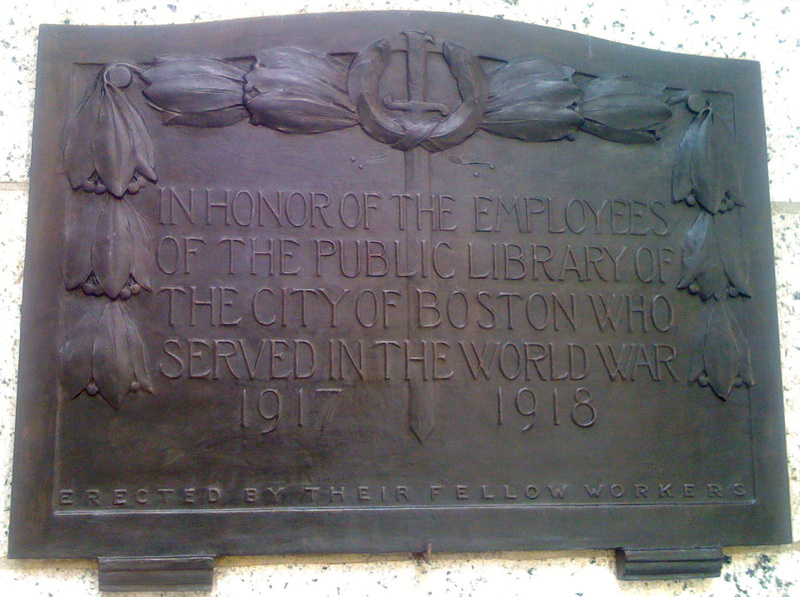 As a side note, Boston Public Library stands in Copley Square. The entrance from the square is flanked by the magnificent sculptures of two seated women titled Art and Science by Bela L. Pratt, Allen’s instructor, mentor and friend. Inside the Library are two other sculptures of note, Bacchante and Infant Faun by MacMonnies in the courtyard fountain and the pair of Lions on the entry stairway by St. Gaudens brother Louis. Across the square is Trinity Church. Inside the entrance from the square to the right of the entrance to the sanctuary is another very large lettered tablet by Allen. To the left on the side of the church is the heroic size statue of Phillips Brooks by Augustus St. Gaudens, Pratt’s mentor. Allen was studio assistant to Pratt and Pratt to St.Gaudens. 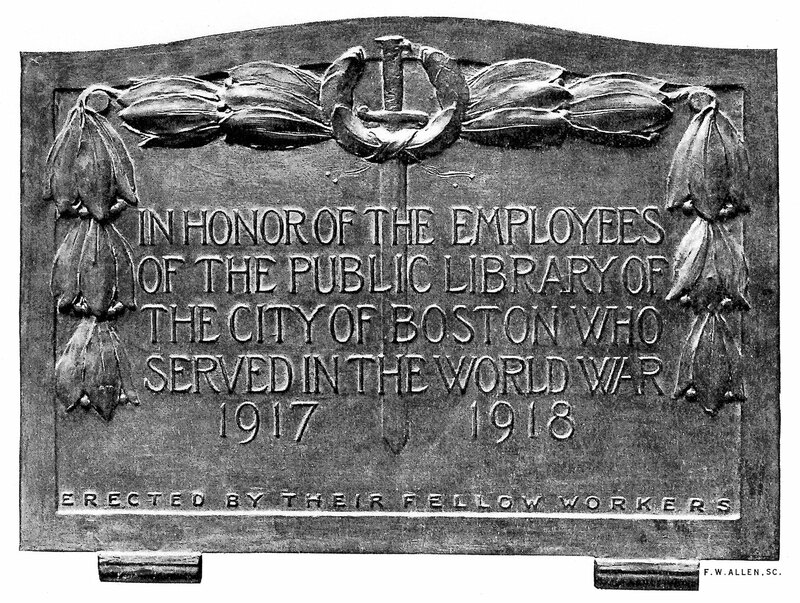 The legacy to which Allen belongs is there in the outdoor sculpture in Boston’s Copley Square. 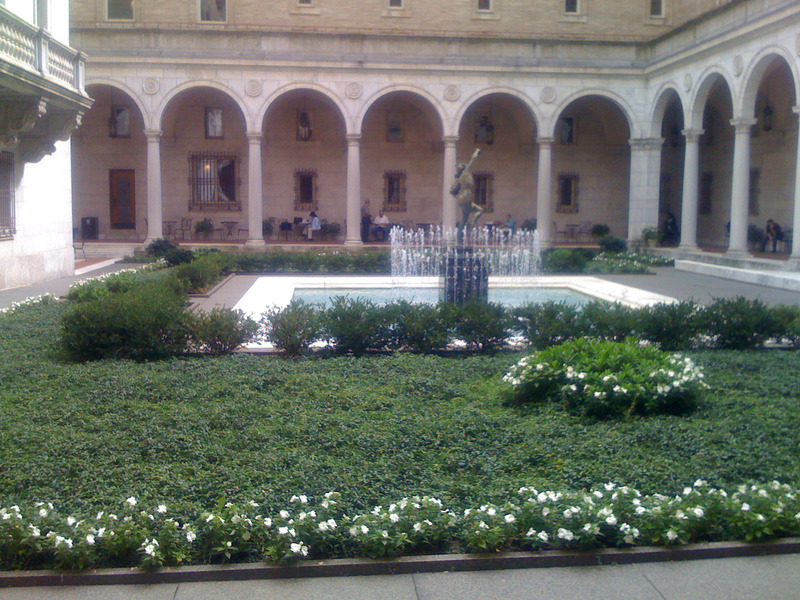 The view from the North Wall of the Boston Public Library courtyard. An additional note about the BPL building: McKim, Mead and White were the architects, the style was Renaissance Revival and Beaux-Arts, one in which Allen was trained in Paris, by Bela Pratt, by association with the work of Augustus St.Gaudens and in collaboration with other significant classical architects of the time. The central tower of Trinity Church was designed in part by Stanford White of the same firm. Charles Coolidge was associated with them and involved in the Trinity Church porch addition. 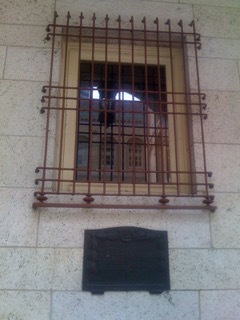 It was he who awarded to Allen the memorial plaque that hangs inside the Copley Square entrance of the church. Publication: BPL Dedication program booklet, BPL also has on file a published list of the members of the BPL Employees’ Benefit Association, a donation acknowledgment ticket and two card bearing the list of items in collection, a card describing the memorial tablet and a photo of the work reproduced by related publications.